Light fade test reports for three Epson Stylus Photo 1270 print samples have now been given blue public links on the AaI&A website. The tests results are for the following recommended papers: Epson Premium Glossy Photo Paper, Epson Colorlife Photo Paper (a swellable polymer paper with improved gas fade resistance but no longer available), and Epson Matte Paper Heavyweight (now sold as “Epson Premium Presentation Paper”). The test samples were started in light fade testing at AaI&A in May, 2008. To date, they have been evaluated with the I* metric for retained color and tonal accuracy at 10 Megalux-hours of exposure and just recently at the 20 Megalux-hour interval. It may seem irrelevant to evaluate a technologically obsolete printing system like the Epson 1270, but there are good reasons. The Epson 1270 samples easily demonstrate key differences between current industry test methods and light fade testing conducted at Aardenburg Imaging & Archives. Consider, for example, AaI_20080422_SN002. 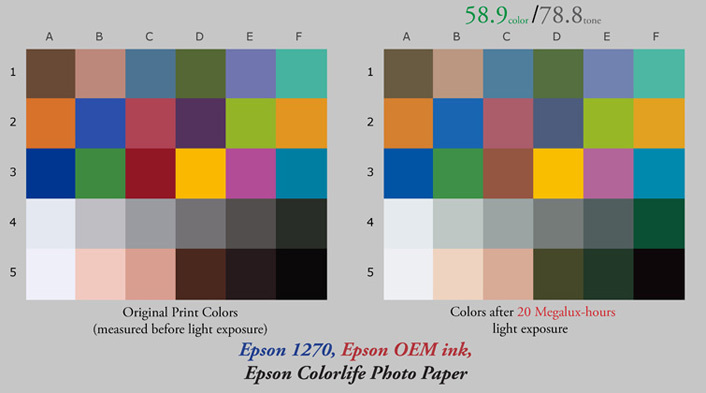 The figure above shows the fading response of Epson Colorlife Photo Paper printed on an Epson 1270 with the recommended Epson ink set. This printer/ink/paper combination received an industry-sponsored display life rating of 25 years for “noticeable” fading to occur. The prediction was based on average display illumination conditions of 450 lux for 12 hours per day and at commonly encountered temperature and relative humidity conditions (75˙F/60% RH). The industry-sponsored test used cool white fluorescent lamps at high intensity illumination levels exceeding 30,000 lux. The “noticeable” fading determination was made by continuously exposing a test sample to the high intensity light source and monitoring the time to reach a defined fading endpoint based on a set of densitometric criteria for allowable fade. The cited multiple failure criteria provide limits for various possible pathways of change (i.e, density losses in “pure” colors patches, density shifts in color balance on neutral color patches, changes in paper white color, etc.). The specific criterion that leads to the end of the test and determines the subsequent display life prediction is not generally reported, so the end-user usually doesn’t learn what is “noticeable” as the product fades. Only two levels of density are customarily evaluated, 0.6 and 1.0, and a total of only 9 color patches are tracked (two cyan, two magenta, two yellow, two neutral, and one paper white patch). This industry test method does not include high density or maximum black color patches. In comparison, the AaI&A light fade test reports allow the viewers to judge for themselves what is “noticeable”, “objectionable”, etc., and where and how the the visual changes are most likely to appear in a print over time. They also give I* color and tonal accuracy scores as the exposure doses progress in 10 megalux-hour intervals. AaI&A tests also use full spectrum fluorescent lamps that give a better spectral match to typical indoor natural daylight spectra, and the intensity levels are less than 15,000 lux. The lower intensity in test helps to reduce the amount of high intensity reciprocity law failure which can lead to an over optimistic extrapolation of the results to more benign real-world display conditions. AaI&A tests also establish microclimate conditions that are much closer to real world picture frame environments. AaI&A tests include “day/night” lamp cycles that allow samples to re-hydrate during the dark cycle. Try judging for yourself what visual change is occurring and whether the I* scores make sense to you in the Epson Colorlife Photo Paper report. Ten Megalux-hours equates to an estimated time on display of just 5 years at the industry standard assumption of 450 Lux illumination for 12 hours per day. Twenty megalux-hours equates to an estimated time on display of just 10 years. The AaI&A test has not yet reached the 50 Megalux-hour exposure dose required to extrapolate 25 year display life performance, but the 20 megalux-hour results already show ample visual changes. The I* scores already rate this product as having poor overall color accuracy and only satisfactory tonal retention at the 20 megalux-hour mark. The scores also indicate that some colors are now giving a “false impression” of the original color content (i.e., the I* color scores for the worst 10% of the colors are now in negative value territory). Note how significantly the dark skin tone colors have acquired a false greenish hue while the lighter skin tones are still retaining some color accuracy. The current industry test methodology evolved from traditional color photographic processes where the color fading characteristics are fairly similar throughout the full tonal scale, especially between mid range density values and shadow values up to and including maximum black density. By testing mid range values one could generally infer what was happening to shadow tones and maximum black areas in a conventionally processed color photo. As can be seen in the figure above, this technical assumption about comparable mid tone and shadow tone fading response no longer holds true for inkjet prints. Note how severe color shifts are occurring proportionately more in areas of the AaI&A standard test target where the dark color patch values generate higher ink loads and require liberal use of high concentration magenta ink to form the correct hue and chroma. (e.g, patches D2, D5, E5, F4). The Epson 1270 printer, like many other desktop inkjet printer models, reserves black ink for maximum printed black areas such as black text or RGB = 0, 0, 0 image areas (color patch F5). However, dark colors other than maximum black are often comprised of significant amounts of cyan, magenta, and yellow components but no black ink. The dark colors therefore differ fundamentally in fading performance from the maximum black areas in a print. To summarize, inkjet printing systems require a full tonal range of color patches to be tested in order to validate media white, highlight, mid tone, shadow, and maximum black performance. The most widely cited industry light fading test methods at the present time do not fulfill this requirement. The AaI&A basic light fade test target, AaI_StandardColorSet(v2)forSRGB.tif, contains 30 color patches that bracket the full tonal range as opposed to 9 that only check paper white and limited tonal range in current industry test protocols. The AaI&A basic test target has a much greater chance of catching problems arising throughout the full tonal scale. A larger target sample size would be better still, but the AaI&A 30 patch test target strikes a reasonable compromise for color sampling and amount of space taken up in the light fade testing equipment (an important consideration when trying to conduct tests on many samples).